We would be remiss not to spotlight Susan Brown’s delightful Skeleton City Puppets installation on Thomas Street in South Lake Union, which looked glorious in yesterday’s sunshine. 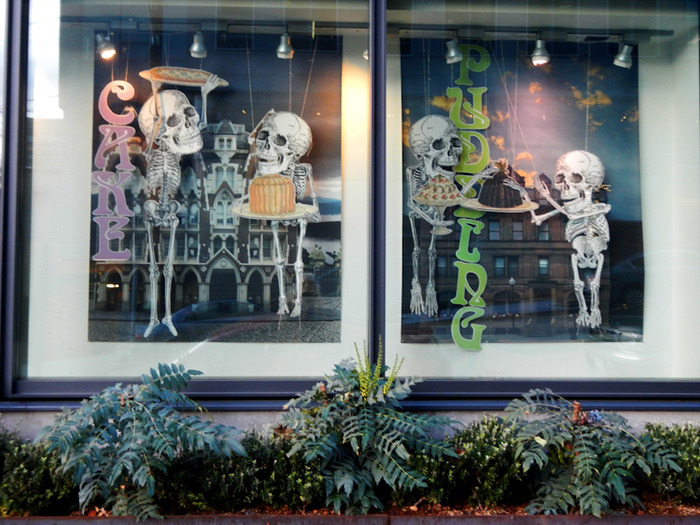 Paper puppet skeletons loom over brick storefronts mischievously playing with various objects, from butterflies to cakes sourced from a Victorian cookbook. Puppetry, found images, and a darkly comic joy animate this evolving installation that is changing over time as Susan updates and animates the puppets and their toys. Please stop by the Thomas street windows (1110 Thomas) and see what she is up to next, and also take in Michael Harrison’s Sentinels project next door!